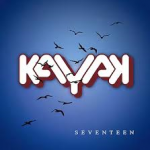 Share the post "Album review: KAYAK – Seventeen"
Kayak was founded in 1972 by keyboardist/composer Ton Scherpenzeel, who is the sole remaining original member, as the band release their seventeenth studio album. Ton is joined in Kayak by singer Bart Schwertmann and guitarist Marcel Singor, plus additional members bassist Kristoffer Gildenlöw (ex-Pain Of Salvation) and drummer Collin Leijenaar (Neal Morse/Dave Bainbridge). Kayak are a big name in their native Netherlands and rightly so based on this musical treat, that encompasses prog, pomp and even a little bit of musical in the grandiose arrangements on a couple of songs. Take ‘Walk Through Fire’ a song that combines plenty of organ/keys along with massed harmony vocals and a strong melody running throughout the song’s ten minutes. The other epic on here ‘La Peregrina’ mixes melodic rock and the aforementioned musicals styling. Bart Schwertmann shows what a fine singer he is on this one and opener ‘Somebody’ – this song has a Queen sound and really reminded me of A.C.T., another fine band that successfully mixes progressive music with a big dose of melody and pomp. ‘All That I Want’ could easily be lifted off a Frontiers release from say Eclipse, with a big chorus and piano led melody, wonderful listening and impressive guitar solo by Marcel Singor. The instrumental ‘Ripples On The Water’ features a special guest appearance from Camel’s Andy Latimer and needless to say it sounds a lot like Camel. Ton Scherpenzeel had apparently written this piece of music with working with Camel in mind. This entry was posted in ALBUM REVIEWS, ALBUM REVIEWS (Mobile), All Posts and tagged album, Andy Latimer, Camel, Kayak, melodic, prog, prog rock, Progressive Rock, review, Seventeen, Ton Scherpenzeel. Bookmark the permalink.